Fun to drive and fun to own – that’s how Kelley Blue Book describes the vehicles that are included in its “10 Coolest Cars Under $18,000,” available used used at OffLeaseOnly for prices that are thousands below retail! 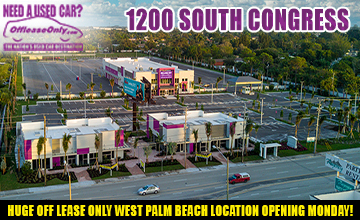 Topping the list are the popular Kia Soul, the Volkswagen Golf, the Honda Civic and Fit, the Fiat 500, all popular used car choices that OffLeaseOnly customers in Miami, Palm Beach, Lake Worth and Orlando are snapping up quickly. Other vehicles on the list include the Ford Fiesta, the Chevrolet Sonic, the Subaru Impreza, Jeep Renegade and the Mazda3. At OffLeaseOnly, these popular used cars cost thousands less than retail and are available with a variety of amenities, including Bluetooth, navigation, backup camera and heated seats. One of the most popular cars on the list is the Honda Civic, which receives accolades for its fuel economy and reliability. 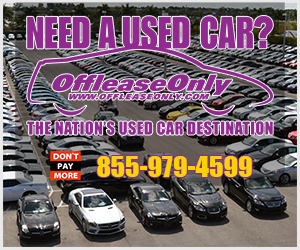 OffLeaseOnly’s inventory includes nearly 30 used Honda Civic models ranging in price from $10,999 to $16,999, equipped with a variety of amenities including leather, moonroof and backup camera. OffLeaseOnly Used Honda Civic Owner Sarah Van Duys received her car for graduation. 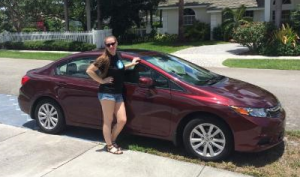 Davie resident Vickie Van Duys recently purchased a used 2012 OffLeaseOnly used Honda Civic for her daughter Sarah for a high school graduation gift. Van Duys chose a beautiful metallic maroon Honda Civic equipped with a tan leather interior, Bluetooth and sunroof. She liked the car for its reliability, smart looks and affordable pricetag of $13,499. The vehicle was exactly what Van Duys’ daughter wanted and the sporty little car was pristine. Van Duys had originally considered a Volkswagen Passat but changed her mind when she spotted the Honda Civic. It was perfect. “It was in real good shape and had all the bells and whistles. It also had a nice color combination,” Van Duys said. And her daughter Sarah loved the car. Miami sales associate Wilfredo Novoa, who sold Van Duys the used car, wasn’t surprised at her choice: Novoa agreed that the Honda Civic is a perfect first-time car for high school graduates. 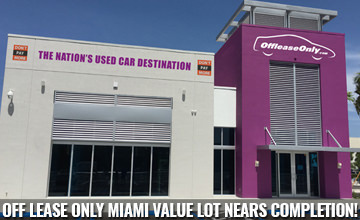 OffLeaseOnly used Honda Civic models sell quickly because they are so popular, Novoa noted. Palm Beach sales associate Juan Palacios, who has also sold many a used Civic, said customers radiate toward the car because of overall efficiency. “It’s the perfect car for your high school kid going off to college. They are reliable and they have good gas economy,” Palacios said. Another car on the KBB list – the Volkswagen Golf – also gets sold almost as soon as it arrives on OffLeaseOnly car lots. OffLeaseOnly used Volkswagen Golf models range in price from $12,999 to $17,999 and are low mileage. Palm Beach sales associate Joe Otero recently sold a 2015 used silver Volkswagen Golf for $15,999 to a customer who loved the perky little car for its driveability and fuel economy. The owner took the car with him to California. 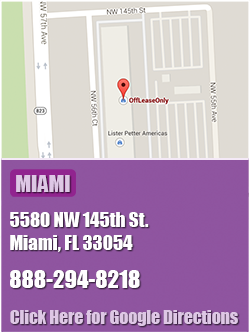 Otero said the OffLeaseOnly used Volkswagen Golf he sold was an incredible deal with only 124 miles on the odometer. The buyer purchased the used car and took it to California. Another head-turner from the KBB list is the sassy little Fiat 500, an adorable subcompact that has a loyal and enthusiastic following. Palm Beach sales associate Danny Pena sold a 2013 white OffLeaseOnly used Fiat 500 to a customer who loved the car for its looks, economy and style. His customer’s OffLeaseOnly used Fiat was equipped with leather and a convertible top. “As soon as she saw it, she loved it,” Pena said. Reviewers describe the Fiat as having “adorable styling” and as “surprisingly spacious” for two people. Another eye-catching choice on KBB’s list of “Cool Cars under $18,000” is the zippy little Ford Fiesta. OffLeaseOnly sales associates have sold several used Fiestas in recent months. OffLeaseOnly used Ford Fiesta models range in price from $8,999 to $11,999, with some priced more than $3,000 below the market value, according to PureCars Value Report. OffLeaseOnly Orlando sales associate Brandon Booher said most customers buy used Ford Fiestas because they are affordable and get good gas mileage. That was the case with the 2014 used gray Ford Fiesta he sold a month or so ago for $10,999. His customers loved the price and fuel economy. 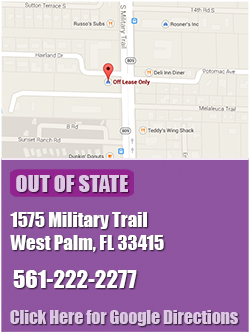 OffLeaseOnly Orlando sales associate Jesse Scott recently sold a 2015 red used Ford Fiesta to a couple who was purchasing the car for their college age son. The parents were thrilled to purchase a used car that was all but new for their child for only $11,999, Scott said. “If Mom and Dad are looking for a car they can get for their kid that will last him for five years through college, it’s a home run,” Scott said. “It’s peace of mind. They don’t have to worry about any issues with the car. It was a nice starter car and totally affordable. “The pricepoint is a huge plus on those,” Scott added. Another happy Orlando customer bought a 2015 used red Ford Fiesta for $11,999. 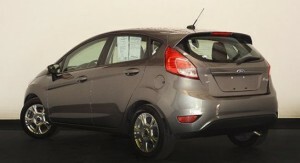 Reviewers call the Ford Fiesta an economy sedan that feels more expensive than it is. A “fun-to-drive small car” with a “nicely-trimmed cabin,” is how the car is widely described. Another cool car that frequently turns up in OffLeaseOnly’s inventory – and it quickly sold – is the Kia Soul, a reliable used car that has received rave reviews on everything from style, amenities, fuel economy and ride. Palm Beach sales associate Dave Alberts sold a Kia Soul about two weeks ago to a father who as buying the funky and fun car as a surprise for his daughter to take to college. Loxahatchee residents Russell and Kim Clothier surprised their daughter with the beautiful blue 2014 Kia Soul as a high school graduation gift. The Clothiers had been looking at cars for some time before they found the perfect used Kia Soul for $13,999 at OffLeaseOnly Palm Beach with Alberts’ help. They presented the car to their daughter Samantha, 18, the night she graduated from Seminole Ridge High School in the Acreage. “It’s fuel-efficient, it’s small enough for her and it was clean. It was perfect for her and it was the color she wanted,” said Russell Clothier. Alberts said the Kia Soul models are especially popular among younger people, who like them because they are quirky, economical and roomy. 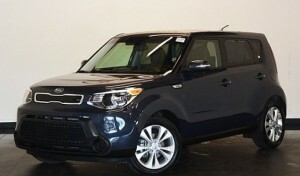 OffLeaseOnly used Kia Soul models range in from $9,999 to $14,999. 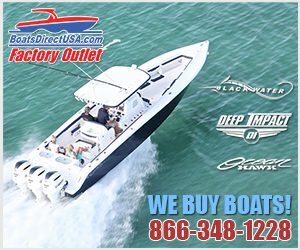 Most include the balance of the factory warranty. OffLeaseOnly customer Jorge Barocio bought a 2013 metallic gray Honda Fit for $12,999 from Miami sales associate Danielle Bjorkgren. Barocio, whose wife and step daughter also drive Honda Fit vehicles, decided to follow suit and expand their fleet of two to three. 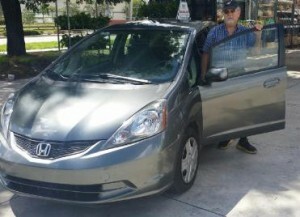 OffLeaseOnly customer Jorge Barocio with his 2013 used Honda Fit. Bjorkgren said customers love the small car for its hatchback, its pep and gas mileage. The Honda Fit has garnered rave reviews for the vehicle’s fuel economy, safety and new technology. The car has been described as versatile, unique with spacious seating and excellent visibility. Bjorkgren said Honda Fit customers seem to be focused on using the card for a specific purpose – such as for work or to accommodate a dog, mostly because of the hatchback. Stop in to one of Off Lease Only four locations and drive home your next beautiful used Nissan Maxima today! 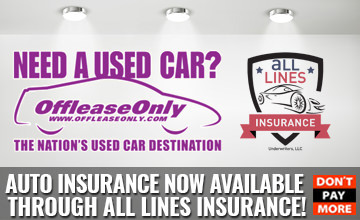 ← Previous Story OffLeaseOnly is the ONLY Place to Buy a Used Luxury SUV for Less! Next Story → OffLeaseOnly’s Top 10 Best Selling Used Cars!